A Keatsian moment this morning: a light rain so soft it was almost a mist, blackberries ripening, haws a rich, satiny scarlet and elderberries a deep inky blue-black, like a magpie's wing. And all of this in the hedgerow along the local playing fields. On our walk this morning, Iz looked on in puzzlement as I paused to pick the blackberries, emerging with wine-stained hands, scratches and nettle stings (where there are brambles there are often nettles too). But it was worth it! 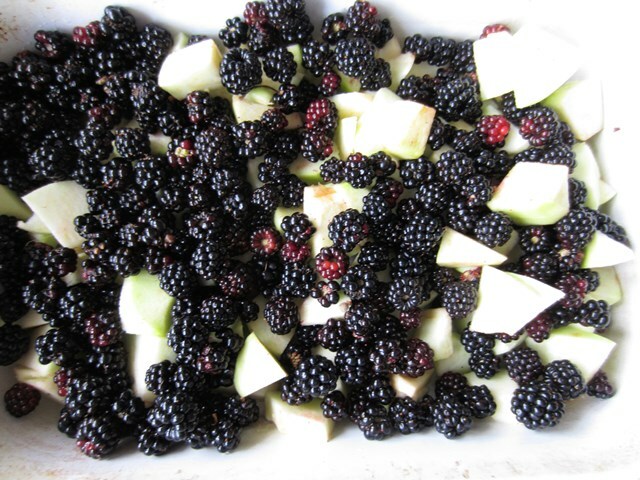 A few hours later we had the season's first blackberry and apple crumble. Yumm. And so the season shifts, the swallows and house martins have left, but the robins have returned and we have one now who sings again from the top of the neighbour's tree. Blackbirds stutter in alarm under the hedges, and in the field the crows and seagulls rise lazily from their foraging in the (still dry) grass when Izzy runs toward them. She spotted a quarry of a different kind in the park one morning and gave chase to a grey squirrel that had wandered rather far from the haven of the trees. It was touch and go whether the squirrel would get to the nearest tree in time, but ... it did, leaving one very confused schnauzer to leap around underneath staring upwards at an apparently empty tree. 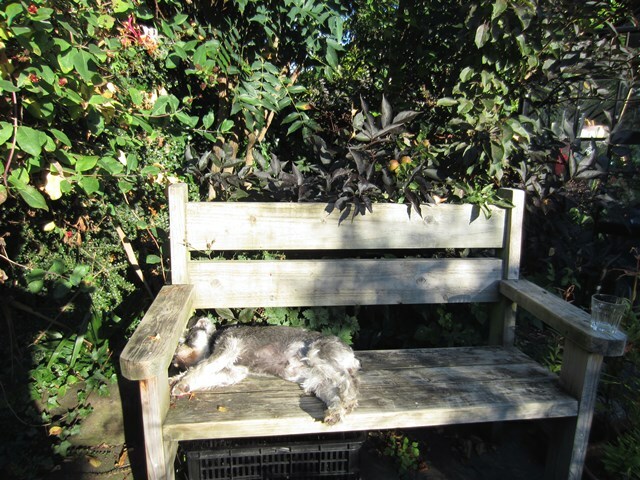 The place to be now in the morning garden is the small bench underneath the honeysuckle and black elder: filtered by the delicate flowerheads of Molinia 'Transparent', the low autumn light still warms up the bench nicely. But while the week ended in autumn, it started in late summer, still warm (15C or so) just after dawn at the start of the week. In the garden, the hoverflies and bees were still busy on the late poppies and verbena, and tomatoes ripened in the greenhouse. 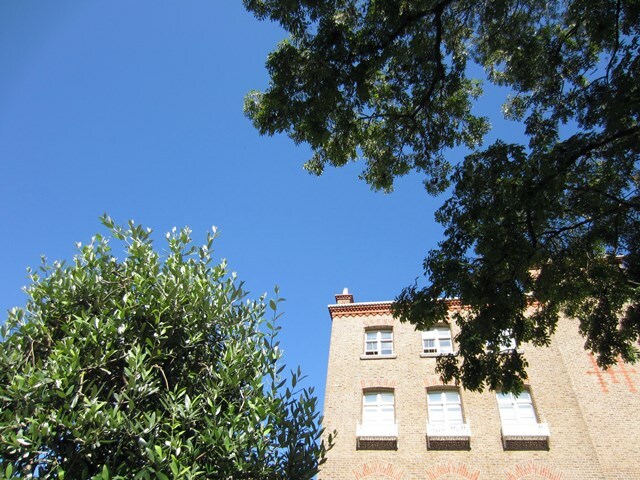 But for me, being in an office meant that the late summer sunshine was glimpsed on lunchtime walks, with blue skies seen between red-brick houses or reflected in the canal. Indoors at home, I've been struggling a bit with the ISBA Alphabet project. We had a great meeting recently where lots of people did a 'show-and-tell' of their work, and there was some beautiful work there. 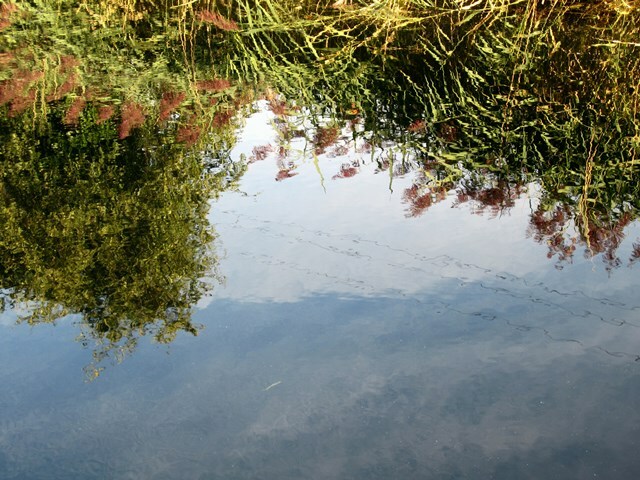 Just as interesting though were the stories of artists' searches for their plants, or the vagaries of those plants either in cultivation or in differing habitats in the wild. 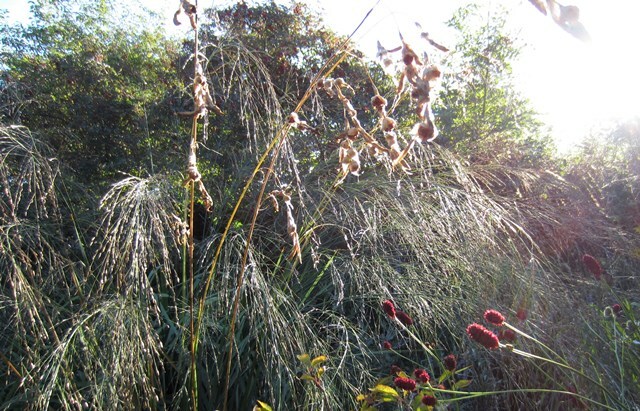 There were artists who spent hours in dunes or on their knees in bogs looking for their elusive and/or tiny plants; there were those who travelled across the country having received the call that their plant was now in flower. There were those who combined history (and trips to the Bots Library and herbarium) with botany in their final piece. But what came through time after time was that each person had come to really know their plant, and in some cases to love it. 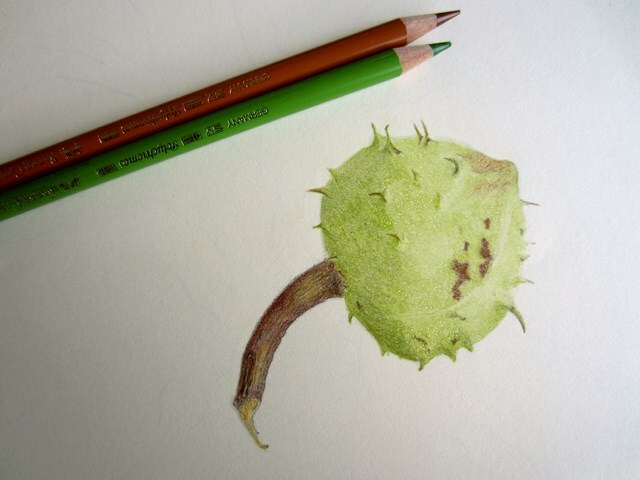 One of the outcomes of the project will no doubt be an array of beautiful plant portraits, but there'll also be a group of people who have come to know and appreciate plants that might previously have been completely unknown to them. All of which I delight in, but the struggle came with the fear that I may not be able to get what's in my head onto the paper, and more immediately, a problem with composition. A visit from an artist friend solved the composition problem (thanks LB!) so now I just have to draw the thing!